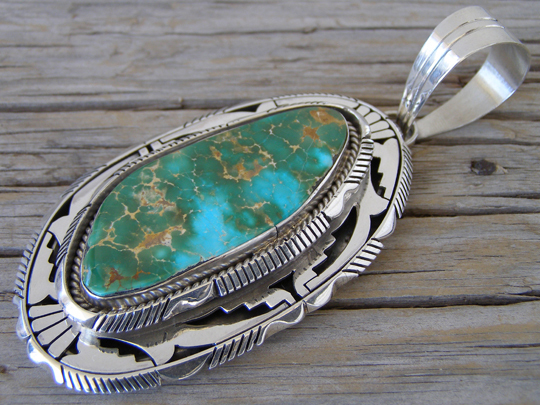 This large pendant is set wiht an over-sized free-form stone of two-tone blue and green natural Royston turquoise. The stone is set in a mooth bezel within a raised shadowbox with a saw and filework border. The stone is reaised above the plane of the cut-out work which constitutes the main decorative element of the pendant. Exquisitely executed and set with a premium stone of rare size. Elouise added a large bale to this pendant and it begs to be strung on a strand of large handmade Sterling beads as shown in the fourth photo (beads not included). Stone: 2 3/16" x 7/8"
Dimensions of pendant (excluding bale & jump ring): 3 1/8" x 1 7/8"
Opening of bale: 18 mm.